Master Slider WordPress slider plugin is a premium image and content slider with super smooth hardware accelerated transitions. It supports touch navigation with pure swipe gesture, that you have never experienced before. Master Slider is a truly responsive and device friendly slider which works perfectly on all major devices. Master Slider plugin is an awesome layer slider as well, with the ability to add any HTML contents (texts, images, …) in layers. It is easy to use, plus there are 80+ ready to use sample sliders for you. You have almost everything such as hotspots, thumbnails, video support, a variety of effects, and many more features in this plugin. Master Slider WordPress slider is the most complete among the best sliders. Master Slider WordPress slider plugin provides easy to use parallax templates that you can use them on your website. These parallax templates let you design your parallax slider in less than ten minutes, by simply using our parallax templates and master slider WordPress visual editor. Parallax slider works smoothly on all themes, with any content that you want to use for your slider. Master slider WordPress plugin touch navigation, offers a variety of options like touch swipe on mobile and drag and drop option for the desktop. Our touch-enabled media slider allows users to drag and swipe the slides smoothly. Master Slider is one of the easiest plugins on Envato marketplace, which also greatly extends functionality into touch-support mobile devices. Video gallery is one of the most important tools for business owners, to promote their services or products. Master Slider WordPress plugin allows users to create stunning Youtube and Vimeo sliders for their website. With Master Slider ready-to-use video templates, you can create elegant video gallery just in minutes. The best plugin on Envato marketplace to create Youtube slider, is Master Slider WordPress slider plugin. All you need is to choose one of our Youtube video slider templates and embed the link of Youtube video. Creating Master Slider Youtube Slider is one of the easiest ways to get more traffic and shares for your website. 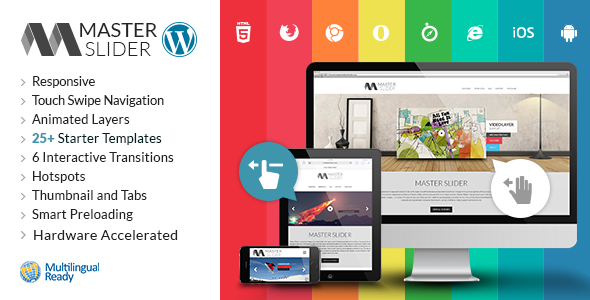 Master Slider WordPress layered slider plugin has different layers with amazing options. There are five editable layers you can add to your slides: Text layer, image layer, video layer, button layer, and hotspot layer. You can simply customize the style, transition, and content of each layer. Each layer can be animated too! With animated layers, you can insert or embed HTML formatted texts, links, images, and videos directly into your slides and add unique animation parameter such as effect, duration, delay, etc. You can create image and content slider with Master Slider WordPress slider plugin. Any content can be added to the slider. Master Slider awesome features help you easily add images and other content, besides, you can customize them in any way you wish. Master Slider lets you add transition and style to any element in the slides. Also, you are able to have an image slider. Adding images to the slides is as simple as dragging the images into the slides, the images will be automatically added to slides. There are different image services. Instead of uploading the same images you have already used on those websites, it is easier to get your images automatically from there and show your images on a slider. Master Slider WordPress plugin integrates with Flickr and lets you create a slider by your Flickr images. Your latest Flickr images will appear on a slider, with or without author name, image title, and image description as a text layer on the slides. With more than ten extremely creative post slider templates, Master Slider is the best WordPress slider plugin to display your website posts in a classy slideshow. 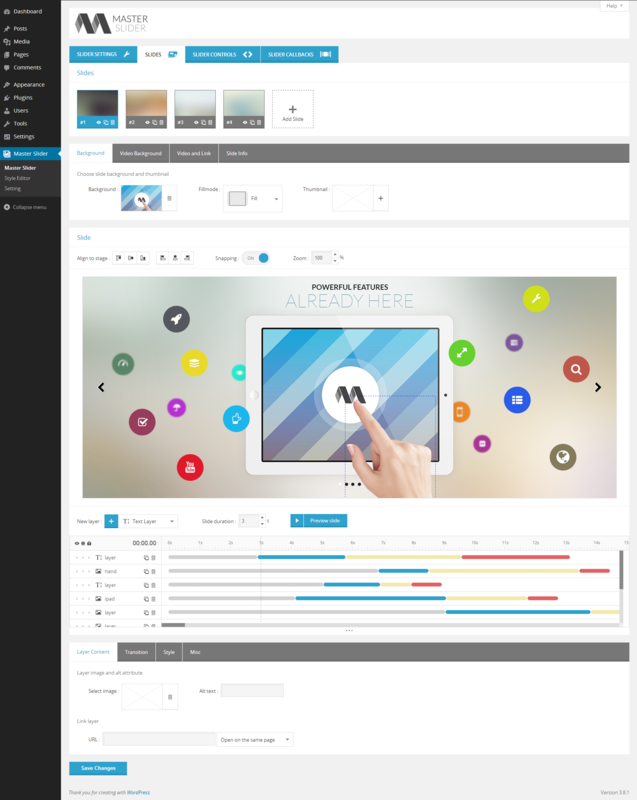 Just select one of our post slider templates and build your lovely slider without editing your current posts. You can simply choose a category or more than one category, and represent all of the available posts on a slider automatically. Master slider is the best product gallery slider that turns your WooCommerce website to an interactive product gallery. With variety of WooCommerce slider templates, you are able to improve your product image slider and increase your sale conversion rate.